Russian engineers are still trying to communicate with a wayward Mars moon probe, and they have until early December to fix the spacecraft and send it on its way, according to news reports. Russia's unmanned Phobos-Grunt spacecraft launched Nov. 8 on a mission to the Martian moon Phobos. The probe reached Earth orbit as planned, but its thrusters never fired to propel it toward the Red Planet. While all attempts to contact Phobos-Grunt since then have failed, the mission team hasn't given up hope, according to Russian news service Ria Novosti. "We estimate that the Phobos-Grunt will fly until January, and to make it perform its mission we still have time until the beginning of December," said Vladimir Popovkin, head of Russia's Federal Space Agency (known as Roscosmos), according to Ria Novosti. Phobos-Grunt is currently zipping around Earth at an altitude of about 124 miles (200 kilometers). First contact with the probe was originally planned to be made at a much higher altitude, so engineers have scaled back the strength of the signal sent to the spacecraft, according to Ria Novosti. Phobos-Grunt weighs about 14.5 tons, and much of that weight is highly toxic hydrazine fuel. Some analysts have expressed concern that this fuel — as well as pieces of the probe itself — could pose a danger to people on the ground if Phobos-Grunt ends up crashing to Earth in a month or two. But Popovkin downplayed those worries. "There are 7.5 metric tons of fuel in the aluminum tanks on board. We have no doubts that they will explode [and destroy the probe] upon re-entry," Ria Novosti quoted Popovkin as saying. "It is highly unlikely that its parts would reach Earth." Phobos-Grunt is Russia's first attempt at a planetary mission since 1996, when the Mars 96 spacecraft crashed into the Pacific Ocean. 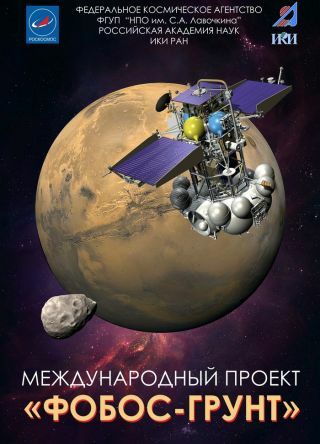 If Phobos-Grunt cannot be saved, it would continue Russia's long string of Mars failures. The nation has launched 18 other spacecraft toward the Red Planet since 1960, and not one of them achieved full mission success. If Phobos-Grunt falls back to Earth, it would also mark the third such uncontrolled spacecraft re-entry in the last few months. In October, a dead German satellite known as ROSAT fell over the Bay of Bengal after orbiting Earth for 21 years. And in late September, a defunct NASA Earth-observing spacecraft called UARS burned up over the southern Pacific Ocean. No one was hurt in either case.